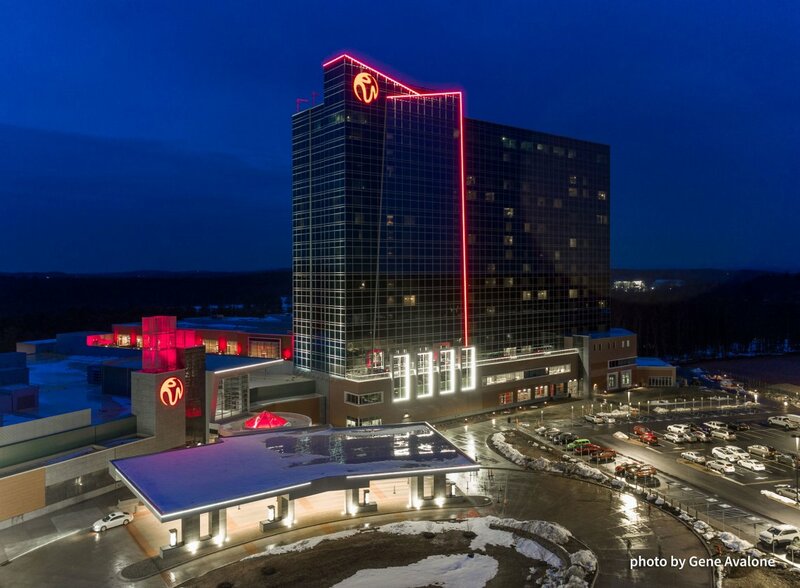 Resorts World Catskills, Monticello, NY, is a newly developed destination resort for gaming and entertainment. 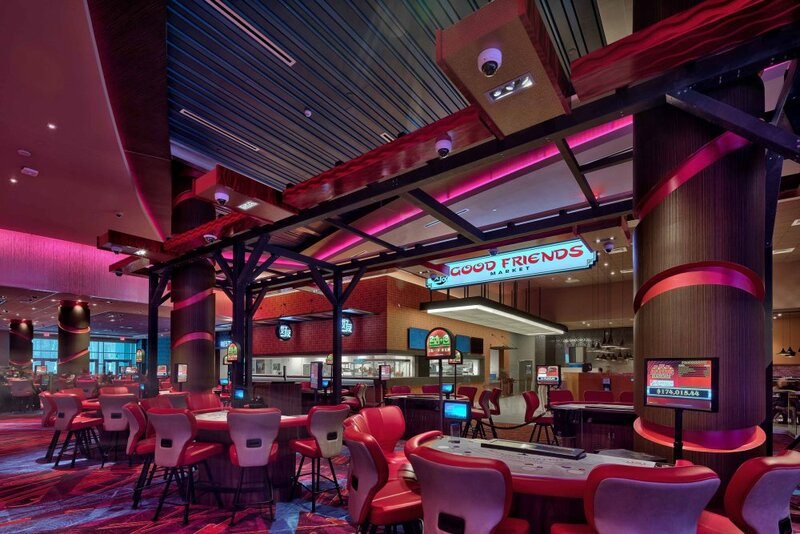 This casino is approximately 1.6 million SF with a project cost of $500 Million. The resort includes 332 hotel suites, 6 full service restaurants, a 2,000 seat events center, full service spa, adult and family pools, meeting and entertainment spaces and a gaming area with 2,150 slot machines and 130 table games. To develop a 5-star experience at the resort with complete systems commissioning and system integration for building control, room control, audiovisual system and lighting control. The goal was met by achieving maximum LEED credits while congruently pushing the envelope of energy efficiency and comfort. The high rise hotel building and lights that illuminate the resort are seen from a distance and draw the public into the complex. The lighting design for the property begins at the parking area where a 999 car, evenly illuminated lot area makes patrons feel safe. The parking area was designed to LEED standards to minimize light trespass, reduce sky glow and improve nighttime visibility with uniformity. This energy efficient and glare controlled lighting design is located in a rural area with careful attention given to reduce the consequences of development for wildlife and people. When walking in from the parking lot, the façade emerges out of the rolling landscape. The bands of light on the roof scape include over 400' of video delivery style programmable LED lighting that creates movement and visual interest in framing the 18 story glass façade. The three signature metal mesh towers and over 50 property planters are part of the video color change system for an ever-evolving resort experience. The slow change of property color was carefully designed with thoughts of views from both inside and out. The final system programming and time scheduling was beta tested the night before the property's opening. Lighting Dynamic was an integral part of the process and continues to fine tune the light levels and programming as owner development takes place. 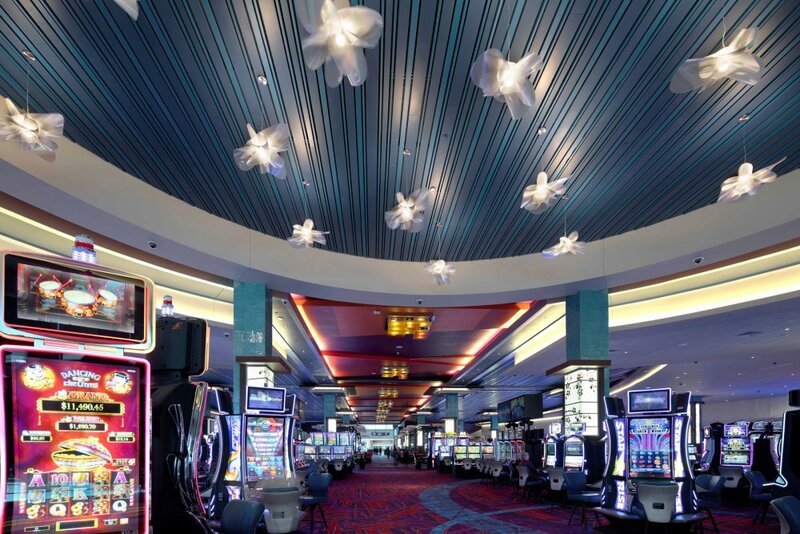 The project team felt it was important to include this supporting phase as too many casino implementation processes leave the owner with an unfinished and complicated lighting control system. The property made the wise decision to combine both lighting and audiovisual control. Singular high definition touch screens manage each separate space for full integration of TV, lighting and sound control. There are over 60 touchscreens located throughout the property that enable the facility the ability to control and adjust these systems. 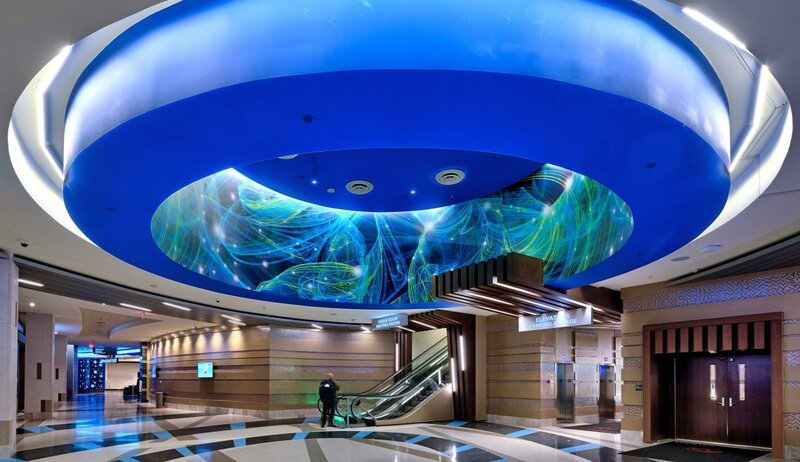 As you enter the facility at the main entrance, the gaming experience begins with a large, two story atrium space that boasts a "clean" metal ceiling. This metal ceiling utilizes a multi-trade 8" wide recessed trough that houses track heads, sprinkler heads, speakers and smoke detectors. The "clean" ceiling is vital as a light show is projected from below onto the ceiling surface. Each light show is built to promote excitement in the newly created gaming experience. Views of the light show are from both inside and outside of the building. Time scheduling, movement effects and light ray interaction were all developed by Lighting Dynamic (LD). There are over 25 custom light fixture types that were built to the custom specifications of Lighting Dynamic. Each custom fixture type begins at concept design with the architect and is brought to reality through the LD custom fixture design bid process. Internal illumination, materials, size and dimming compatibility are developed in bidding documents by the LD design team during the design phase to allow custom fixture manufacturers to bid competitively but maintain the Architect's vision. Special attention is paid to the custom lighting package to control costs and to keep the project under budget and on schedule. Each of the signature restaurants develop a unique dining experience. 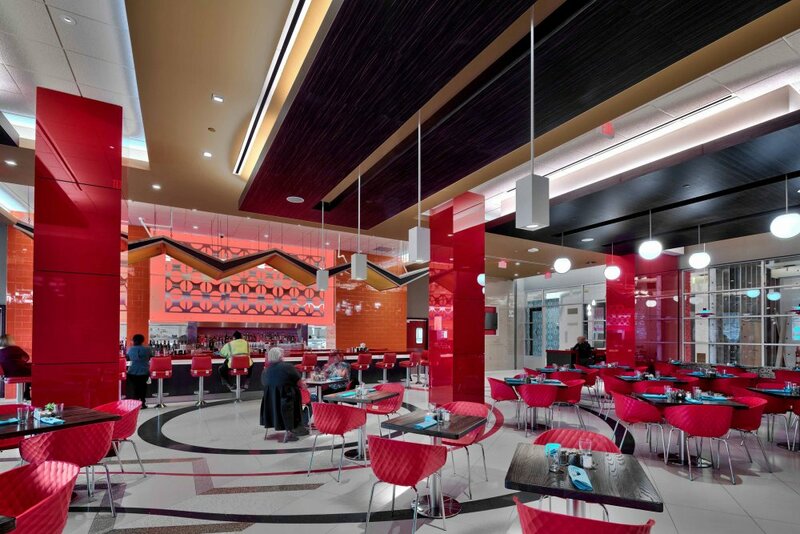 The property's interior landscape was designed by the Architect to draw patrons to each dining or entertainment venue. The architectural lighting design pays particular attention to detail for patron movement and special interest to match interior elements in all VIP level areas. Various custom structures and millwork details were developed for lighting sheet type installations. These custom designs illuminate evenly a multitude of acrylic sheets and metal cut material features. Control system programming was developed in the control narrative and on site adjustments were fashioned to depict different lighting scenes. 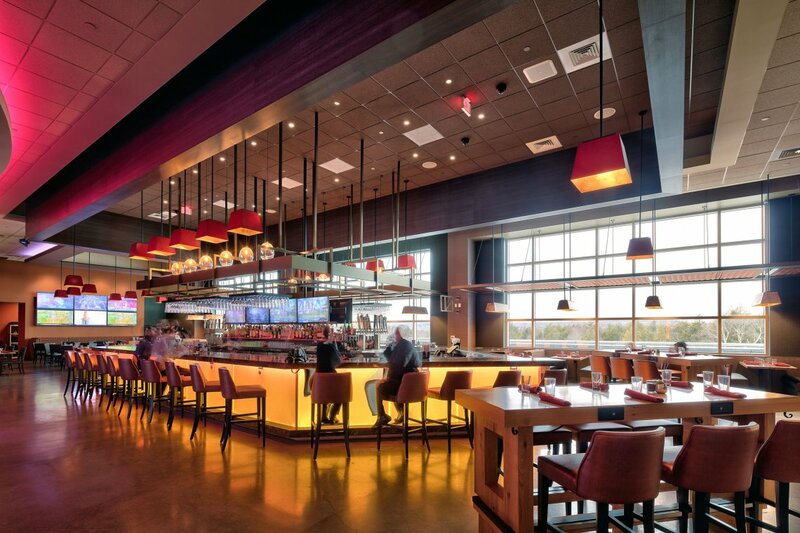 The hands on site time that was performed by Lighting Dynamic created a seamless transition of construction process to ownership, leaving the property with a complete operating system readily usable by the facility staff. As M/E Engineering and Lighting Dynamic are also the commissioning agent consultants for the property, the team is finishing the controls of the lighting system design that is both intuitive and functional. Integral to the casino floor are two live entertainment stage locations with control programming and LED color change lighting system designs that allow for quick change between show experience and normal bar operation. Lighting and A/V are integrated into each space for synchronized light movement and sound. Under the property's State Contract, the project must achieve LEED certification. 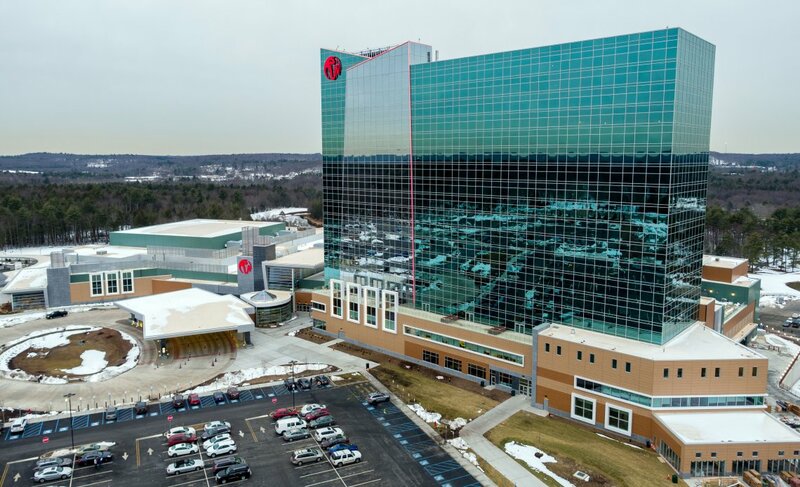 Achieving LEED certification is a difficult task but this is the third casino M/E Engineering designed that required LEED certification this past year. The LEED consultant design team's due diligence helped to meet all the prerequisites and elevated code standards throughout the process. Serving as both the engineer and LEED commissioning agent allowed M/E Engineering and Lighting Dynamic to help guide the construction process from beginning to end. The hotel energy management system controls all elements of patron comfort, reverting the room lighting and temperature back to each patrons settings upon entering but reverting to economy mode while vacant. M/E Engineering simplified the engineering and LEED consultant team for the Architect which was critical for the fast track construction schedule for this project. Services provided were -- Data Design, Lighting Design, MEP/FP Engineer and Commissioning Agent. This multi-discipline capability allowed M/E Engineering to tightly coordinate the interaction between the property management system, building control system, data networks, A/V system and lighting control system designs. Find out how Lighting Dynamic and M/E Engineering can assist you with your next project.